Aerospace Industries Association (AIA) - Trade association representing the nation's leading manufacturers of commercial, military, and business aircraft, helicopters, aircraft engines, missiles, spacecraft, materiels, and related components and equipment. American Gulf War Veterans Association (AGWVA) - Seeking to obtain treatment for those service members and their families who experience symptoms collectively known as the Gulf War Illness. American Institute of Astronautics and Aeronautics (AIAA) - The principal society of the aerospace engineers and scientists. American Logistics Association - Trade association of manufacturers, their representatives, brokers, distributors, publishers and others who sell or provide products and services to military resale and MWR activities. Armed Forces Communications and Electronnics Association (AFCEA) - AFCEA represents the professional communications, electronics, intelligence, and information systems community. Arms Control Association (ACA) - Organization dedicated to promoting understanding of and support for effective arms control policies. Association of the United States Army (AUSA) - A private, non-profit educational organization that supports America's Army - Active, National Guard, Reserve, Civilians, Retirees and family members. Association of Old Crows (AOC) - An international professional association with over 14,500 members and 111 corporate members engaged in the science and practice of Electronic Warfare (EW), Information Operations (IO), and related disciplines. Association of the U.S. Army (AUSA) - Association of over 100,000 individual, business and organization members dedicated to maintaining a strong national defense with emphasis on landpower and the role of the U.S. Army. Publisher of Army Magazine. Association of the United States Navy (AUSN) - Advocate for Navy interests. British American Security Information Council (BASIC) - An independent research organization that analyzes government policies and promotes public awareness of defense, disarmament, military strategy and nuclear policies. Canadian Defence and Foreign Affairs Institute (CDFAI) - Provides Canadians policy analysis of Canada's foreign affairs and aid policies and the state of its military preparedness. Committee Opposed to Militarism and the Draft (COMD) - An anti-militarism organization that challenges the institution of the military, its effect on society, its budget, its role abroad and at home, and racism, sexism and homophobia inherent in the armed forces and Selective Service System. Conference of Defence Associations - Advocacy group in Canada's defence community, representing over 50 defence associations from all parts of the country. Electronic Industries Alliance (EIA) - Primary trade organization representing the U.S. high technology community. Enlisted Association of the National Guard of the United States (EANGUS) - Representing the Army and Air National Guard to members of the House and the Senate. Federation of American Scientists (FAS) - FAS combines the scholarly resources of its member scientists and informed citizens with knowledge of practical politics. Its site hosts projects such as Arms Sales Monitoring, Biological Weapons, CyberStrategy, Intelligence Reform, Military Analysis, Monitoring Emerging Diseases, Nuclear Weapons, Secrecy and Government and Space Policy. Fleet Reserve Association (FRA) - Organization representing the interests of enlisted members of the U.S. Navy, Marine Corps, and Coast Guard. Institute for Defense Analysis (IDA) - Assists the Office of the Secretary of Defense, the Joint Staff, the unified commands and defense agencies in addressing national security issues, particularly those requiring scientific and technical expertise. Iraq Afghanistan Veterans of America PAC (IAVA PAC) - The goal of the IAVA PAC is to put Iraq and Afghanistan War Veterans in Congress who are critical of the execution of the war in Iraq and representative of the principles of IAVA in the U.S. Congress. Iraq Veterans Against the War (IVAW) - The mission of IVAW is to mobilize the military community to withdraw its support for the war and occupation in Iraq. Judge Advocates Association (JAA) - U.S. national bar association dedicated to practitioners of military and veteran related law. Military Officers Association (MOOA) - Representing the interests of military officers and their families at every stage of their careers. Military Religious Freedom Foundation (MRFF) - The concept and practice of religion in the United States military dates back to the earliest days of this nation. MRFF's role is to ensure government adheres to the spirit and the letter of the Constitution as it relates to free practice of religion. Military Spending Working Group (MSWG) - A coalition of two dozen research and advocacy organizations seeking to educate members of the public, news media, and government about the possibility and desirability of reducing excess military spending globally. National Aeronautic Association (NAA) - NAA's primary mission has been the advancement of the art, sport, and science of aviation in the United States. NAA has a diverse membership and we encompass all areas of flight - from skydiving and models to commercial airlines and military fighters. National Guard Association of U.S. (NGAUS) - NGAUS has the goal of obtaining better equipment, standardized training and a more combat-ready National Guard by petitioning Congress for resources. National Purple Heart Wall of Honor - Commemorates the extraordinary sacrifices of America's servicemen and servicewomen who were killed or wounded in combat. 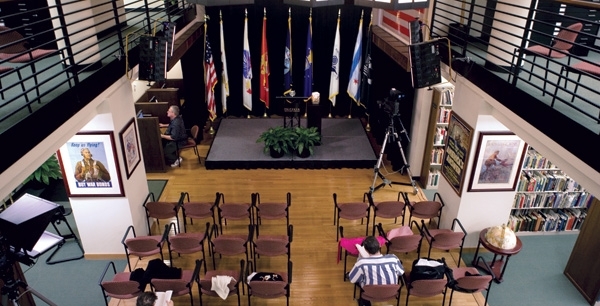 The mission of the Hall of Honor is to collect and preserve the stories of Purple Heart recipients from all branches of service and across generations to ensure that all recipients are represented. Also see FAQs. National Veterans Legal Services Program (NLSP) - For more than 25 years, the National Veterans Legal Services Program has been helping veterans who-because of the effects of military service-have been unable to share in opportunities available to most Americans. We serve these forgotten veterans through advocacy, education, litigation, training, and publications. Naval Construction Force (Seebees) - Construction battalions and special units. Naval Enlisted Reserve Association (NERA) - Advocate for interests of sea service reservists of the Navy, Marine Corps and Coast Guard. Navy League of the U.S. - Civilian organization dedicated to the educating U.S. citizens, including elected officials, on Naval issues and to the support of the men and women of the sea services and their families. Non-Commissioned Officers Association - Works for the benefit of noncommissioned and petty officers and their families. North Atlantic Treaty (aka The Washington Treaty) - Forms the basis of the North Atlantic Treaty Organization (NATO). The Treaty was signed in Washington D.C. on 4 April 1949 by 12 founding members. Collective defence is at the heart of the Treaty and is enshrined in Article 5. Allied Command Operation - At the strategic level, the NATO Command Structure (NCS) encompasses two Commands - Allied Command Operations (ACO) responsible for planning and execution of all NATO operations and Allied Command Transformation (ACT) responsible for NATO's transformation. Supreme Headquarters Allied Powers Europe (SHAPE) located in Mons, Belgium, is the strategic level headquarters of ACO and commanded by Supreme Allied Commander Europe (SACEUR). SACEUR assumes the overall command of operations at the strategic level and exercises his responsibilities from SHAPE. He issues strategic military direction to the subordinate commanders. SACEUR is responsible for the preparation and conduct of all Alliance military operations, including routine operational activities and other non-operational tasks in accordance with the division of responsibilities between both SCs. Stop NATO - Newslist run by Rick Rozoff. Supreme Allied Commander Europe (SACEUR) - Responsible to NATO's highest military authority, the Military Committee, for the conduct of all NATO military operations. SACEUR, traditionally a United States Flag or General officer, is dual-hatted as Commander of the US European Command. His NATO command is exercised from the Supreme Headquarters Allied Powers Europe (SHAPE) at Casteau, near Mons, Belgium. Pan American Health Organization (PAHO) - An international public health agency working to improve health and living standards of the countries of the Americas. It serves as the specialized organization for health of the Inter-American System. It also serves as the Regional Office for the Americas of the World Health Organization and enjoys international recognition as part of the United Nations system. Reserve Forces Policy Board (RFPB) - Principal policy adviser to the Secretary of Defense on matters relating to the reserve components. Reserve Officers Association (ROA) - Represents active, retired, and former Reserve, Guard and Regular commissioned officers and warrant officers of the Uniformed Services in the U.S.
Society of American Military Engineers (SAME) - Military engineers, government officials, and civilian engineers promoting engineering in support of national defense. U.S. National Guard Association - From national security and military objectives to domestic support, the Guard is ready to serve. U.S. Naval Institute - One of the world's foremost sources of knowledge of naval and military affairs. Worldwide membership in the U.S. Naval Institute has grown to over 80,000. U.S. Navy Memorial - Honors all who have served in the sea services and perpetuates their heritage, values and traditions. Veterans for Common Sense - In an age when the majority of public servants have never served in uniform, the perspective of war veterans must play a key role in the public debate over national security issues in order to preserve the liberty veterans have fought and died preserving. Veterans for Common Sense seeks to inject the element of Common Sense into debates over war and national security. Veterans for Peace (VFP) - Veterans from World War II, Korea, Vietnam, the Gulf War, other conflicts working together for peace and justice through non-violence. Vietnam Veterans of America (VVA) - Promotes and supports issues important to Vietnam veterans. Women in Aerospace (WIA) - Dedicated to expanding women's opportunities for leadership and increasing their visibility in the aerospace community. Women in Defense (WID) - Provides its members with opportunities for professional development and networking, cultivating the advancement of women leaders in government and industry professions. This webpage last updated on Wednesday, January 6, 2016 5:53 PM.